Paul Merson has launched a scathing attack on Arsenal, albeit with a tone of disappointment over how things have been handled at his former club. It wasn’t so long ago that the Gunners were being praised for an impressive unbeaten run across all competitions, but the fact is that they remain in fifth place in the Premier League table, six points adrift of fourth. Perhaps with that in mind, Merson has been very critical of the Arsenal defence, and believes that until it is shored up and changes are made, Unai Emery will continue to encounter the same problems in their bid to compete for major honours. “Until they sort out the defence, they won’t be able to achieve anything. Aaron Ramsey was Arsenal’s best player last weekend – he’s leaving on a free. I don’t know where the club is going,” he said, as per Sky Sports. In his defence, Merson does make several valid points in his argument as ultimately he’s right to criticise the way in which Arsenal have lost the likes of Alex Oxlade-Chamberlain, Jack Wilshere and Alexis Sanchez in recent times, while Aaron Ramsey’s contract will expire this summer. 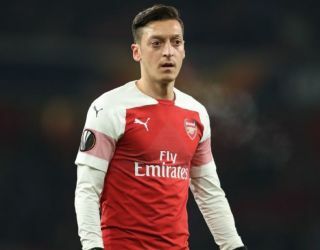 However, he has now added that Mesut Ozil must be the next to go as ultimately, his reported big-money contract coupled with his inability to establish himself as a key figure for Emery could make him a problem for the club moving forward. Given the German playmaker has been limited to 16 appearances so far this season, being dropped by Emery on several occasions while also suffering with various injury setbacks, it doesn’t look particularly positive for his long-term future at the Emirates. Time will tell if he does leave if he isn’t playing a key role for Arsenal, but clearly Merson believes that the club could be forced into making another big decision in the immediate future which could have a key impact on their plans moving forward.